Gideon is a minister in the Anglican Church of Uganda. 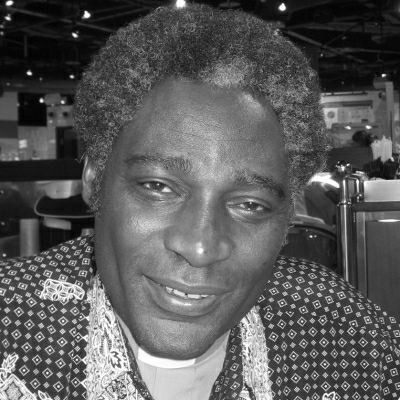 In 1992 he became the first African religious leader to announce publicly that he was HIV-positive. Gideon was about to come to Britain to study with his wife when she suddenly became seriously ill and died. Gideon’s sister-in-law found out that his wife had died of AIDS, but she kept the information to herself. Gideon was completing his studies; she feared that the bereavement and the potential implications of an AIDS diagnosis would be too much to bear at that critical moment of his education. When he had finished his exams she told him what she knew and advised him to get an AIDS test. It took him three months to pluck up the courage to do this. He said what gave him the strength to go was that he realised that if he could survive the death of his beloved wife of twenty-five years, nothing could destroy him. He received the results of his test from a counsellor, who looked at his priestly collar and said with a mocking voice, ‘Man of God, what are you going to do now?’ From that moment, Gideon entered a land that was foreign to him: the land of stigma. To have an HIV positive diagnosis in Uganda at that time meant that one had been cursed by God. The illness was connected to prostitution, homosexuals—so called ‘sexual deviants’—and long distance lorry drivers who had many sexual partners. Gideon’s career as a minister and a lecturer in a theological college was over. As he travelled home he had debated with himself. He was devastated. He could choose to be silent and lead a double life. He knew however that that was not acceptable for a man of faith. Spiritually he knew that he needed the support of fellow Christians to bear what was happening to him. They couldn’t help him if he didn’t tell them. He knew as well that he would need the help of friends and family to get medicine and receive care. He knew that silence would mean that he had no community. He resolved to trust in God and to be open instead protecting himself from shame. First he disclosed his situation to the principal of his college and his wife’s sister. Then he told the college staff and his students and eventually his Bishop. A person with AIDS needs a circle of support at work, in his church and in his family. That circle of support is open but at the same time it is confidential. Gideon realised that there is another form of openness: to become completely publicly open. This is not something that everyone needs to do or even has the strength to do. It is a tough choice, which demands a lot of sacrifice. It is a calling. The counsellor who handed him his results thrust Gideon into the world of stigma. This was also the first step on his journey towards his calling. Gideon discovered that he could use his position to uphold the dignity of those who were stigmatized everywhere in Africa. He is now able to feel gratitude towards the man who spoke to him as he did in his moment of supreme vulnerability. It was that experience which awoke him to the needs of his fellow human beings in a new way. Gideon has since won the Niwano Peace Prize in recognition of his work in upholding the dignity and human rights of people living with AIDS.